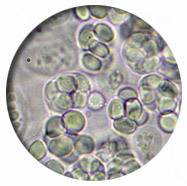 Fungi are a diverse group of organisms which are part of the natural environment. They grow on organic matter with different life habits. 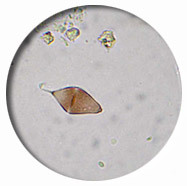 Some fungi are obligate parasites on plants. They need living plants to survive. Others exist in symbiotic relationships with plant roots. 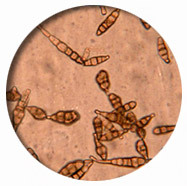 The third group is called saprophytes. Almost all molds belong to this group. They grow on a variety of organic matter, from fruits and vegetables to leather, wood, paper, and even plastic or adhesives. 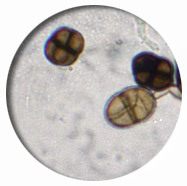 Molds propagate by means of microscopic spores which are floating through the air. Under proper conditions (food and moisture) mold can grow in indoor environment and cause building related illnesses. These illnesses vary from mucous membrane irritation (allergic reaction) to pulmonary hemorrhage in infants. Presence of mold indoors does not always present a health problem. However, some people are sensitive to molds. Allergic individuals who suspect molds as the cause of their symptoms should seek professional advice. They may consult their physician, an environmental consultant or federal and state environmental safety agencies. These are the currently available Mold Analyses at Micro Analytical Laboratories, Inc.
Non-viable Mold in Air (Spore Trap): Genus ID and counting, in spores per cubic meter. Non-viable Mold in Tape Lift: Genus ID. 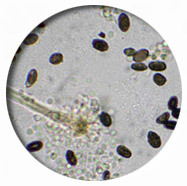 Non-viable Mold in Bulk Material: Genus ID. 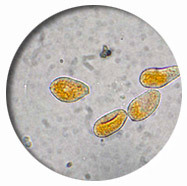 Other microbiological analyses (Total Coliform and E. coli) are available. Please contact us (contact@labmicro.com) for information. Micro Analytical Laboratories, Inc. is a testing laboratory and does not perform mold sampling, consulting or remediation. However, we are working with qualified and highly competent environmental consultants who can assist you with your problem. Micro Analytical Laboratories, Inc. continues to be a high quality laboratory, emphasizing reliable service and efficient sample turn-around. Our well qualified and experienced analytical staff is headed by Nasser Kashani, Ph.D. a biologist with extensive research experience in Plant Biology, Mycology, and Wood Science. Dr. Kashani is a graduate of the University of California, Berkeley.